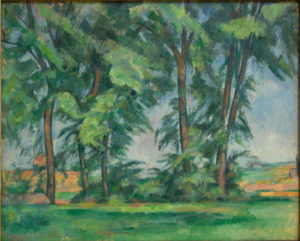 We learn much about Cézanne’s painting from comparing the magnificent Les Grands Arbres au Jas de Bouffan to its motif. 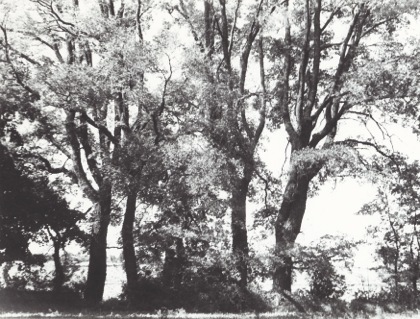 By the time the photograph was taken in 1935 the trunks had thickened and the space in the center had become denser, but the heart of the comparison — the treatment of the foliage — had remained unaffected. The small, slowly posed parallel touches align nearly all the foliage in one of two diagonal directions and create powerful diagonals against the tree trunks and ground; the canvas as a result opposes two frameworks, a vertical-horizontal one and diagonal one. But one’s response to the painting is not primarily intellectual; it is easily emotional first of all, and this to two qualities that leap to the eye: its pure, carefully balanced color, and the artist’s painstaking control over the density of its space, particularly in the center. Both qualities may be judged in relation to the motif. In choosing colors Cézanne was both closely attentive to the hues of his surroundings and highly sensitive to the harmonies that they made possible. There is no escaping a frequent contradiction between these two sensibilities. A cultivated landscape such as a garden may contain a surfeit of reds, yellows, oranges, violets and whites; to a Cézanne this would be too much. 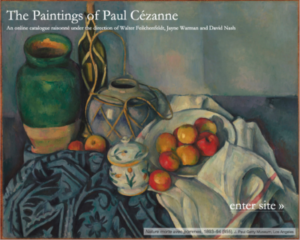 On the other hand a motif may be too muted or its hues may be too close to each other: then Cézanne may amplify the colors by introducing neighboring warm and cool hues into them, or inserting sharp, saturated accents. Cézanne’s color system was always controlled, typically confined as it was to two, three, or four color groups, depending on what best fit the site. Of those, the most natural (for landscapes) was a group of three colors, and in rare instances (more often in still lifes), four. Whatever adjustments he felt compelled to made would be best seen in a painting already based on a three-color motif whose local hues might not be quite in harmony. To judge from the color of late-summer fields around Aix-en-Provence and the present surroundings of the Jas de Bouffan (the family residence) the motif presented three clear color groups — the blue of the summer sky, the straw color of the parched fields, and a broad variety of greens. Of all the considerations crucial to Cézanne one stands out in most of his paintings: attaining a warm-cool balance. In the motif, the blue (at the cool end of the spectrum), the straw yellow (at the warm end), are simple and stable and are represented more or less literally; with the greens in the middle, it is they thast have to adjust. That is what happens here: the pigment for the sky would be cobalt blue and for the parched straw, Naples yellow — and for the foliage a single pigment; a cool emerald green. That green, though cooler than the local one, achieves clarity and balance in one stroke.